Today is the 31st Anniversary of a little film called Star Wars. These films, along with Indiana Jones, were as much to blame for who I became as an adult as Walt Disney World was itself. 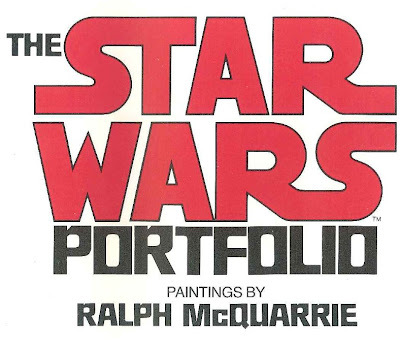 Several years ago I was fortunate to run across a copy of The Star Wars Portfolio by Ralph McQuarrie at a silent auction. The auction ran for several days, and I made sure I was on hand for the final hour, ensuring my ability to outbid anyone immediately who tried to steal this jewel out from under me. No one came, the portfolio was mine, and the fact that I was so intent on claiming this portfolio only served to further my propensity for geekiness to family and friends. But perhaps I should allow the portfolio to speak for itself. McQuarrie, born June 13, 1929, in Gary, Indiana, was influenced by his grandfather, who did watercolors, and his mother, who drew and painted. It wasn’t long before he settled on a career in art. He took an art major in high school, studied technical illustration, and then went to work for the Boeing Company. There he met people who had studied at and recommended the Art Center School in Los Angeles. After two years in Korea, he enrolled at Art Center as an illustration student. 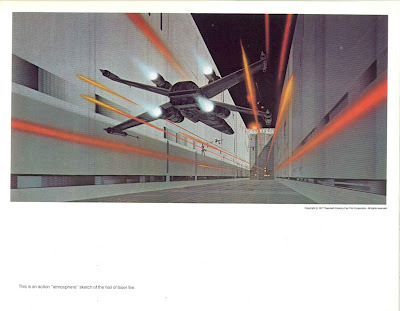 The ease with which McQuarrie understood the highly technical visuals required for STAR WARS is partially explained by his earlier work for CBS News Apollo coverage as well as for Boeing, Litton Industries, and Kaiser Graphics. 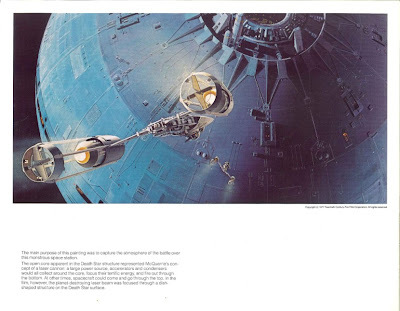 His work for CBS, doing artist’s renderings of the capsule’s travel through space – making visible what could not otherwise be seen – generated quite an interest in McQuarrie’s work. 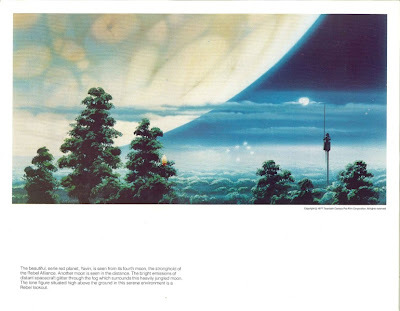 He was soon approached about doing animation background paintings and movie-poster art. 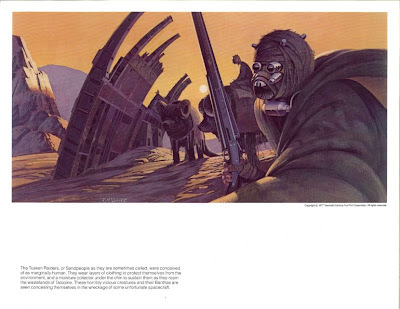 Some production paintings McQuarrie had done for Hal Barwood and Matthew Robbins brought him to the attention of director George Lucas in late 1975. Very soon after, they began discussing production paintings for STAR WARS. 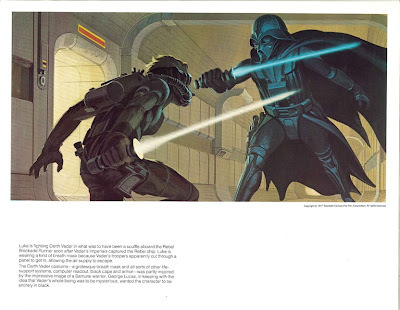 Lucas suggested that McQuarrie approach the work from the point of view of “ideal” portrayals rather than feel restricted by what could actually be achieved in filming the situations represented in the art. The first four or five paintings had been done when STAR WARS was still in the development stage through Twentieth Century-Fox. 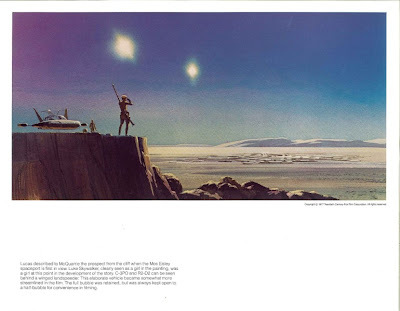 George Lucas felt that McQuarrie’s painting would not only be of interest to Twentieth, but, by helping them to visualize his ideas, would also dissolve any hesitation on their part to go ahead with making the film. 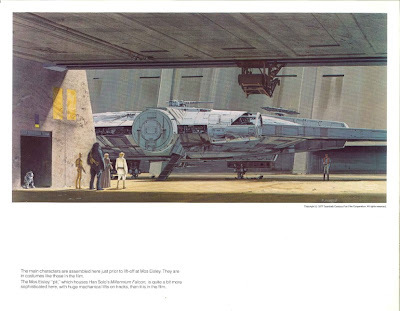 The production paintings were of incalculable value when it came to discussing STAR WARS; production design and costuming. They reflect various changes in visual concepts as well as the evolving story line. 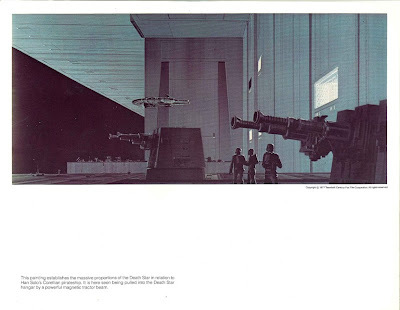 The ideas of not only George Lucas and Ralph McQuarrie are concretized here, but also those of production designer John Barry and model designers Joe Johnston and Colin Cantwell. Mc Quarrie’s paintings were done in a combination of opaque gouache and acrylic on illustration board mounted on hardboard." Luke is fighting Darth Vader in what was to have been a scuffle aboard the Rebel Blockade Runner soon after Vader’s Imperials captured the Rebel ship. Luke is wearing a kind of breath mask because Vader’s troopers apparently cut through a panel to get in, allowing the air supply to escape. The Darth Vader costume – a grotesque breath mask and all sorts of other life-support systems, computer readout, black cape and armor – was partly inspired by the impressive image of a Samurai warrior. George Lucas, in keeping with the idea that Vader’s whole being was to be mysterious, wanted the character to be entirely in black. The Tusken Raiders, or Sandpeople as they are sometimes called, were conceived of as marginally human. They wear layers of clothing to protect themselves from the environment, and a moisture collector under the chin to sustain them as they roam the wastelands of Tatooine. These horribly vicious creatures and the Banthas are seen concealing themselves in the wreckage of some unfortunate spacecraft. Here we have an incipient confrontation as the small group of fugitives try to escape the Imperial Stormtroopers. Chewbacca is carrying the Princess, Han Solo can be seen in an earlier costume design – a blue outfit with a cape; and Luke is in the background. 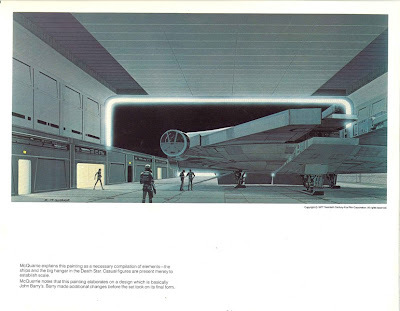 McQuarrie envisioned the hallways as being lit indirectly, through thin slots. Defying standard principles, the light would radiate from these narrow spaces at 360 degrees, while the slots themselves would be detectable only from particular angles. It would be a testament to the genius of these people that they discovered a key to the universe that permitted them to harness an incredible energy in this manner. Lucas described to McQuarrie the prospect from the cliff when Mos Eisley spaceport is first in view. Luke Skywalker, clearly seen as a girl in the painting, was a girl at this point in the development of the story. C-3PO and R2-D2 can be seen behind a winged landspeeder. This elaborate vehicle became somewhat more streamlined in the film. The full bubble was retained, but was always kept open to a half-bubble for convenience in filming. The beautiful, eerie red planet, Yavin, is seen from its fourth moon, the stronghold of the Rebel Alliance. Another moon is seen in the distance. The bright emissions of distant spacecraft glitter through the fog which surrounds this heavily jungled moon. The lone figure situated high above the ground in this serene environment is a Rebel lookout. This painting represents R2-D2 and C-3PO first arriving on Tatooine after their narrow escape from the Imperial Stormtroopers via a Life Pod (which can be seen in the background). McQuarrie used a photograph of the Oregon coast to guide his painting of the landscape, following the line of the cliff and replacing the ocean with sand dunes. C-3PO was inspired by the beautiful robot seen it Frtiz Lang’s classic silent film Metropolis, but Lucas wanted it to look more male then female. 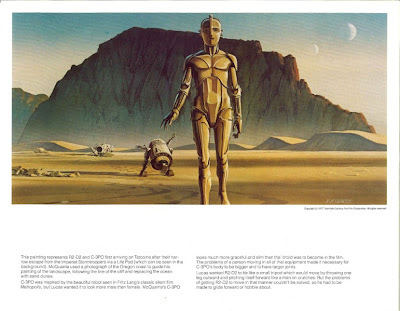 McQuarrie’s C-2PO looks much more graceful and slim than the ‘droid was to become in the film. The problems of a person moving in all of that equipment made it necessary for C-3PO’s body to be bigger and to have larger joints. Lucas wanted R2-D2 to be like a small tripod which would move by throwing one leg outward and pitching itself forward like a man on crutches. But the problems of getting R2-D2 to move in that manner couldn’t be solved, so he had to be made to glide forward or hobble about. The main characters are assembled here just prior to lift-off at Mos Eisley. They are in costumes like those in the film. The Mos Eisley “pit,” which houses Han Solo’s Millennium Falcon, is quite a bit more sophisticated here, with huge mechanical lifts on tracks, than it is in the film. This painting provides the feeling of the battle above the Death Star, from an enemy pilot’s point of view. The targeting device in the cockpit was originally conceived by McQuarrie as being a radar location indicator, registering what was behind and around the pilot, out of sight. The pilot would rely on eye contact up front. In the film, however, the device registered the target in front and did not show what was behind the pilot. The main purpose of this painting was to capture the atmosphere of the battle over this monstrous space station. 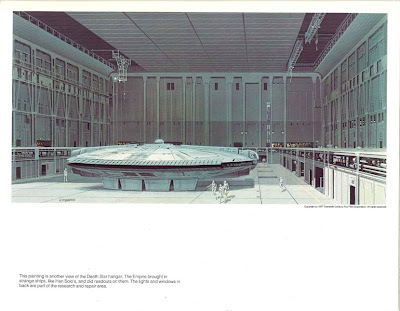 The open core apparent in the Death Star structure represented McQuarrie’s concept of a laser cannon: a large power source, accelerators and condensers would all collect around the core, focus their terrific energy, and fire out through the bottom. At other times, spacecraft could come and go through the top. In the film, however, the planet-destroying laser beam was focused through a dish-shaped structure on the Death Star surface. 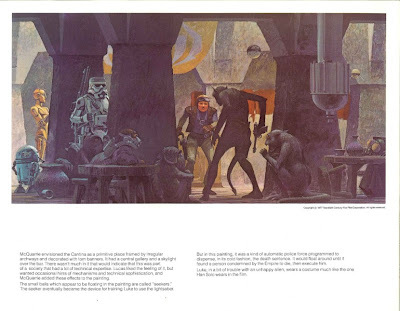 McQuarrie envisioned the Cantina as a primitive place framed by irregular archways and decorated with torn banners. It had a central gallery and a skylight over the bar. There wasn’t much in it that would indicate this was part of a society that had a lot of technical expertise. 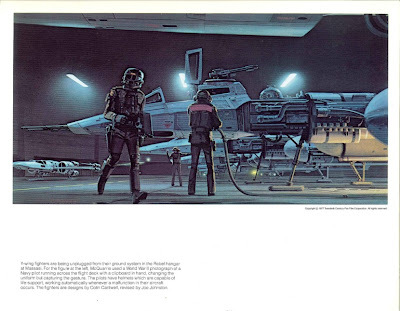 Lucas liked the feeling of it, but wanted occasional hints of mechanisms and technical sophistication, and McQuarrie added these effects to the painting. The small balls which appear to be floating in the painting are called “seekers.” The seeker eventually became the device for training Luke to use the lightsaber. But in this painting, it was a kind of automatic police force programmed to dispense, in its cold fashion, the death sentence. It would float around until it found a person condemned by the Empire to die, then execute him. Luke, in a bit of trouble with an unhappy alien, wears a costume much like the one Han Solo wears in the film. Y-wing fighters are being unplugged from their ground system in the Rebel hangar at Massasi. For the figure at left, McQuarrie used a World War II photograph of a Navy pilot running across the flight deck with a clipboard in hand, changing the uniform but capturing the gesture. The pilots have helmets which are capable of life-support, working automatically whenever a malfunction in their aircraft occurs. The fighters are designs by Colin Cantwell, revised by Joe Johnston. 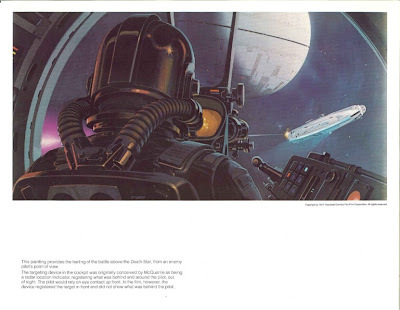 George Lucas wanted to show the scale of the Death Star trench in relation to the fighters as an aid to the special effects people doing the miniatures. 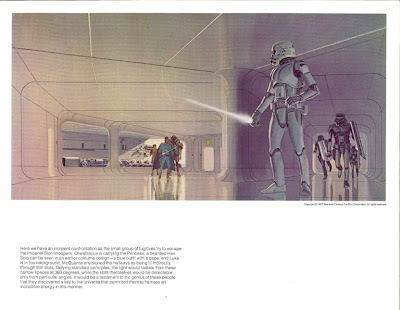 Here, McQuarrie developed what was known as the “Lash La Rue” scene in the depths of the Death Star. The retractable bridge and chasm, over which Luke and the Princess were to swing on a thin cord, were thought to be somewhat close to the center of the battle station. All structures were to radiate from a central core in ever-widening circles. The Sandcrawler, a junk-collecting operation, is a very large and rusty old vehicle containing many storage rooms. 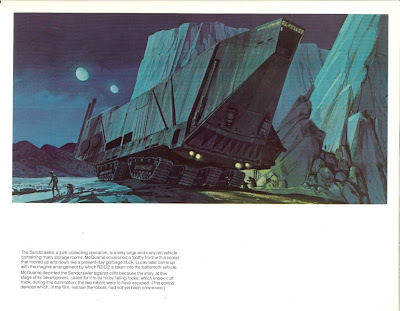 McQuarrie envisioned a toothy front with a scoop that moved up and down like a present-day garbage truck. Lucas later came up with the magnet arrangement by which R2-D2 is taken into the behemoth vehicle. Princess Leia honors those who saved the Rebel Alliance with an impressive ceremony at the Massasi stronghold. Ben Kenobi, who was originally still to be alive at the end of STAR WARS, can be discerned in the small group walking down the center aisle. McQuarrie felt the banners would be indicative of a royal atmosphere. This painting is another view of the Death Star hangar. The Empire brought in strange ships, like Han Solo’s, and did readouts on them. The lights and windows in the back are part of the research and repair area. This is an action “atmosphere” sketch of the hail of laser fire. 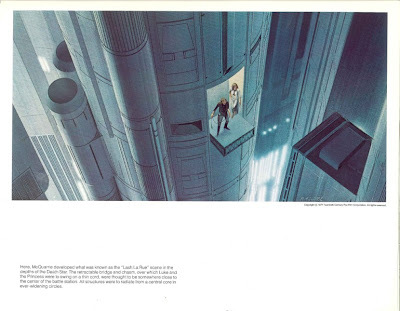 Lucas wanted a row of elevators in the Death Star and McQuarrie made them individual tubes along one of the walls of the many deep canyons in the Death Star. There are a variety of robots, mutations, and oddball characters here, as throughout the film, filling out the concept that the nature of a galactic civilization was that they adapted in a variety of modes to the various environments. 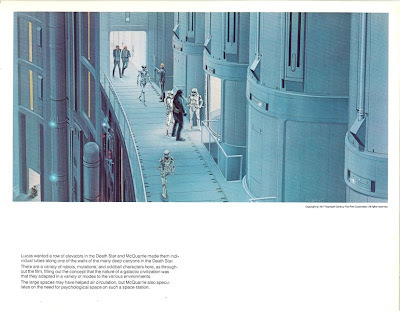 The large spaces may have helped air circulation, by McQuarrie also speculates on the need for psychological space on such a space station. On the fourth moon of Yavin, Rebel troops at Massasi ready themselves for battle. 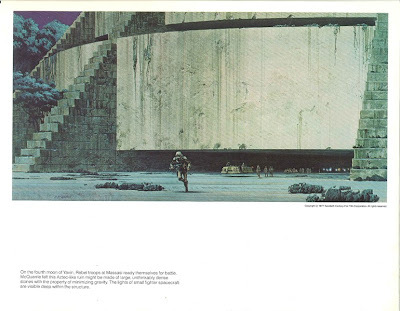 McQuarrie felt this Aztec-like ruin might be made of large, unthinkably dense stones with the property of minimizing gravity. The lights of small fighter spacecraft are visible deep within the structure. 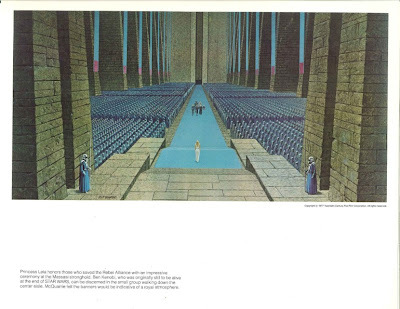 McQuarrie explains this painting as a necessary compilation of elements – the ships and the big hangar in the Death Star. Casual figures are present merely to establish scale. 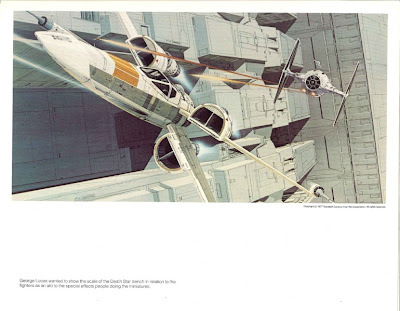 McQuarrie notes that this painting elaborates on a design which is basically John Barry’s. Marry made additional changes before the set took on its final form. This painting establishes the massive proportions of the Death Star in relation to Han Solo’s Corellian pirateship. It is here seen being pulled into the Death Star hangar by a powerful magnetic tractor beam. I dare say you'll have many comments on this one; in the lead up to SWW. Nice work Ryan. I must've spent hours studying these paintings while growing up. Very cool indeed, I now have yet another thing to keep an eye out for on eBay I see... Love the old concept art, thanks for sharing. The painting were great! Its cool and at the same time, its sleek. It gave me a great idea for a gift to my best friend. A Darth Vader adult costume. I'm sure he'll love it.